I’m back in love with radio. Although I have a radio in the car and another in the kitchen I have been re-enthused into actually listening to the good old radio over my iPod by the Roberts solarDAB. Maybe it’s the ease of use, maybe it’s the form factor, perhaps it’s just a really cool gadget. I have another Roberts radio and respect their workmanship and heritage but since breaking the power adapter I have to keep recharging the hulking batteries every so often. This has made me conscious of how much I am using it and that when the batteries run down it’s at least 24 hours till I can listen again. Another small bind is that it’s a standard analogue radio and I find myself having to adjust the aerial when moving from station to station, or if I move the radio, to get the best reception. Enter my new purchase.. 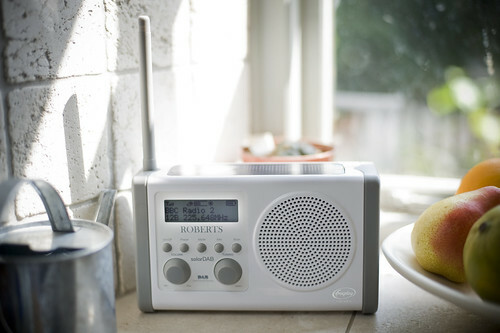 The Roberts solarDAB freeplay powered digital Radio. I managed to pick one up from Currys in Milton Keynes. The manger gave me his own staff discount to see I left the store happy as I had originally gone in for a cheaper solar/wind-up radio, which was out of stock. This is my first DAB radio (Digital Audio Broadcasting) as I have held off for a while, worrying that I may not be able to receive many of the channels. Well I needn’t have worried. Straight out of the box I pressed the scan button and had 20 stations picked up and auto programmed into the dial. The overall form factor is compact, 190mm(w) x 110mm(h) x 80mm(d), easy to move from one place to another and my particular model is white plastic with soft touch rubberised ends and controls. It’s also available in black, pink, red or green, has a built in rechargeable battery pack and although has the solar panel on top It also has a mains lead which in my dark cottage is going to be a necessity in the winter months if I am to want to use it for any great period of time. OK, lets look at some of the features. Interestingly as this is intended to be a radio carried around inside and outside the home, the telescopic aerial is detachable and can be stowed in a little slot on the back. I also imagine this is pretty easy to replace should it be lost or broken. It is totally rubberised when closed and as yet, in my location, I haven’t noticed any need to have it fully extended. It has an 80mm 1 watt speaker which is really quite good. I was a little shocked at the clarity when I first turned it on as it gives out much more than you would expect from a radio this size. As you would imagine, this to me is the most important detail here. The sound. It has more than enough volume for inside the house and I could see it seriously annoying fellow campers or neighbours should you want to take it out and about. Speech is crisp and music is rich. I love the way that the display shows you the data rate in kbps for each station (i.e. TalkSport 128kbps and Classic a whopping 160kbps). As this is meant to be a power efficient device I am not surprised to see the small display. It seems to have all that is needed though. Along with signal strength, station id and selectable data such as time, frequency, network and data rate the display also shows the current battery power and a nifty little solar meter telling you in bars how much light the top mounted solar power is receiving. At first glance I thought it was too small to be of any real use but it seems Roberts have done a good job at making this unit efficient. According to Roberts if your bars are up to half way then the internal batteries are being assisted and you can expect about 27 hours before they go completely flat. If you have more than half the bars lit then you are running the radio from the photovoltaic cells and trickle charging the batteries too. I was reluctant to leave the radio outside all day as being a typical English summer It was raining and although the unit looks pretty sealed, I was not sure how weather proof it was. For the few hours I did manage outside under the overcast sky I noticed no depletion on the battery meter. For a longer test I left the radio on my dark cottage window ledge for a few hours and moved it around the home using it continually at a decent volume. With the little sun it received through my little windows it ran for over 20 hours before giving up the ghost. The solar panel is really quite sensitive and I could see the radio running continuously should you leave it in a greenhouse. I may well just try that.. I just need a greenhouse. On the back of the radio is a power port for the 9.5 volt adapter, a headphone socket and the really welcome addition of a line in port. In the not to distant future when the new family of super sensitive photovoltaic cells on the market out I would love to see devices like this fitted with an additional power output port, so on particularly sunny days you can also charge your other devices i.e. phones, ipods etc. That said, it feels great knowing that should I ever find myself in the gutter, batteries are not one of the expenses I will have to worry about when rocking out in my cardboard box. As far as cost goes, I am more than happy with this radio, but then I didn’t pay full whack for it. I think £70 is a little expensive, but imagine it won’t be at that price for long. We should not be made to pay a premium for tech just because it is ‘Green’. You do pay a little extra for Roberts products and normally it is because you are buying a wood and leather, chic, retro unit crammed with top components. Yes this does look a little like a toy but it feels well made, is easy to clean if dropped whilst gardening and is easy to operate. Regarding the tech behind it. I could probably knock up a solar powered dab radio with an existing cheaper model and a small panel from Maplin but it would be a botch job and I feel the more solar devices we see being offered the better. Going into the electrical store and seeing solar devices on the shelf gave me hope. I feel a little sick inside every time I throw away a handful of batteries and feel we should be way more advanced in this day and age. We all need solar power and radio is bloody great entertainment but don’t buy this because you think it looks cool. Buy this because you need a new radio, you have good digital reception and you want one that can recharge itself naturally.. And when the rechargeable batteries have done their thousand cycles it will still work in sunlight without them! This I hope is just the beginning. If I made a solar powered DAB radio, I would want it firmware upgradable (to be ready for DAB+).. I would like it to have FM as a back up, an SD card slot for playing mp3’s and recording radio through, a lead to power as well as play my ipod and as I said before, a socket through which I could use the solar panel to charge other devices. But that’s just me. I always want more. 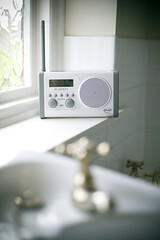 It’s the best solar powered radio I have seen on the market at the moment. Providing you have decent digital reception where you are (check this site) and can afford around £70.. it’s a good buy. I think the world would be better off if we all expected companies to build things to last and not just replaces in 6 months. Nice write up. Thanks Kari, perhaps we need to push for companies to mark products ‘upgradable & future proof’ or give us 10 year guarentees. Is this too much to ask? The history of DAB radio in this country is a sorry one. There were the early days of few stations and high bit rates, which then evolved to many stations and low bit rates, with the sound quality being actually worse than FM. I have had loads of DAB radios over the years (including one in my car before it failed its MOT), but most of them have broken, or now sit in a cupboard somewhere unused because the sound quality on internet radio is now significantly better than the vast majority of DAB stations. Indeed I am sitting here having just hooked up a £10 NOW TV box to my hifi and am listening to Planet Rock over the internet via the Tunein radio app, and it is much better than a 128kbps MP2 stream, which is what DAB offers. That should send signals… a £10 internet box (which also does TV) sounds better than an expensive DAB radio! And the Government is still threatening at some point in the future to switch off analogue radio and force everyone to move to a technology (Mp2) which is frozen in the 1980s. They should be investing in making internet radio easier for people to use on the move, particularly in cars and on public transport. Couldn’t agree more! I recently changed my car (includes built-in DAB) and stream music from my iOS devices more often than not. Am also using NOW TV Box around the home. Thanks for the comment John, I’m listening more to spoken word than music on DAB and don’t notice the audio quality being that bad (in my echoey room). For music I’m mostly on headphones listening to my own collection. Music on DAB has been relegated dancing around the kitchen music for all of the reasons you have shared.